We’ve seen wireless drives from the likes of Seagate and WD before, both of which allow you to connect mobile devices so that you can access more content than you would otherwise be able to while on the road. This little Qnap QGenie that we’re reviewing here is also a wireless drive, but it packs a few more functions (albeit with less internal storage capacity) that make it a rather cool gadget for any tech enthusiast’s bag. Essentially, the Qnap QGenie is a pocket-sized, mobile NAS device that features not only integrated Wi-Fi so that you can connect mobile devices while on the go, it also features a networking port so that you can plug it in to your wireless router and share files that way, too. It has a style that’s reminiscent of an old disk-based MP3 player, but that thickness is there because there are many features built into the QGenie’s sides. You get a USB 3.0 port for plugging in a thumb drive or external hard drive, you get a full-sized SD card slot, and there is the aforementioned network port, too. To load content onto the drive, simply plug it in to a computer’s USB port (it supports USB 3.0 and comes with a cable for it) and drag and drop files onto it as usual. The drive will also charge through this USB port, and this can take about three hours for a full charge. On the front, there is a screen that shows the wireless network name of the drive, as well as information about how many devices are connected, how much of the internal storage is taken, and how much battery life is left. You can press a button to illuminate this display at any time, since it isn’t always on. The little screen shows the info you need. As far as storage gadgets are concerned, it’s one of the most versatile we’ve seen because of all these inclusions, and if that wasn’t enough, there is a little switch on the side that allows you to put it into battery mode so that you can even charge devices from its USB port when you need an emergency top-up. A direct wireless connection is needed to connect to the QGenie in order to access files that are stored on it, and you can set up a pass-through to your existing Wi-Fi network so that you can continue to access the Internet. You can’t use mobile data as per usual when connected to the drive while away from your home wireless network, but there is beta support for hotspots. The drive can accept connections from multiple mobile devices at the same time; we tried it with five smartphones simultaneously and didn’t run into any serious issues. Since there is only 32GB of flash storage built in to the QGenie, you’ll have to make use of the SD card slot and USB port if you want to carry more media with you; all media from all sources will be accessible from within the QFile app. 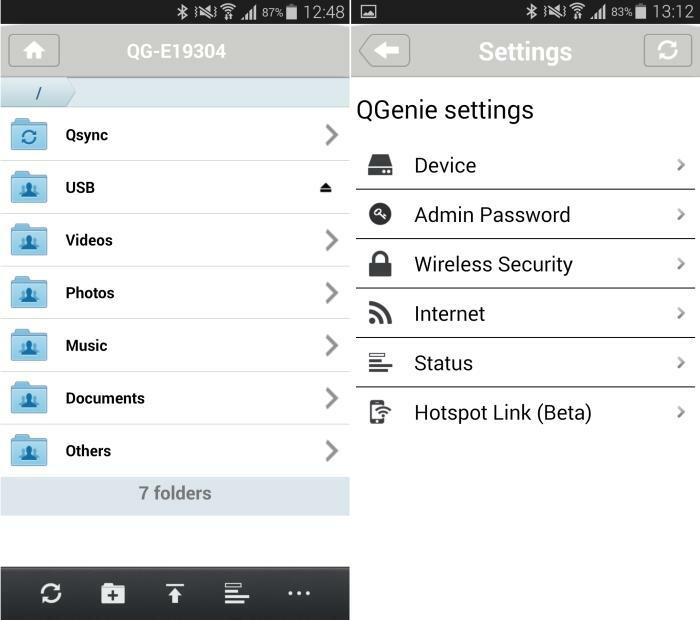 You’ll need to install the QFile app on all the devices that you wish to grant access to QGenie, and, of course, connect them to the QGenie’s wireless network directly in order to see the drive through the app. 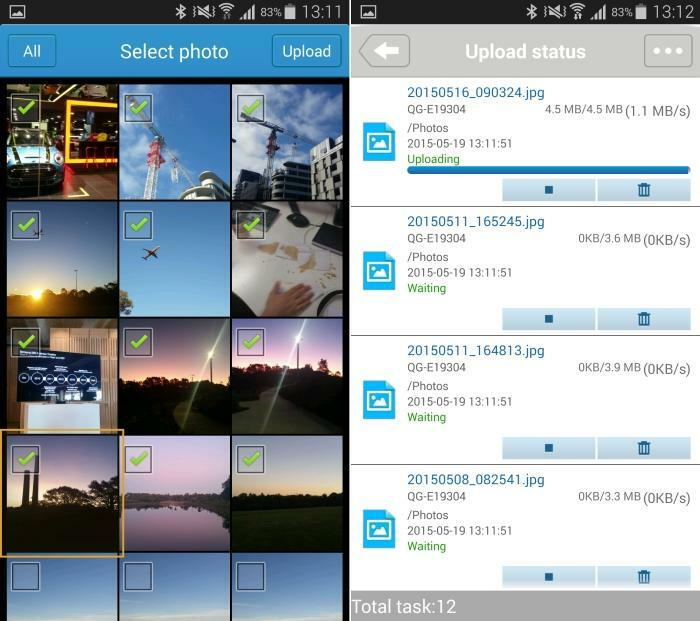 The app lists the different media folders present on the QGenie itself, as well as the folders for USB and SD media, if they are in use. When you select a file, you can either use QFile to play it, or you can choose another player that’s installed on your device. We used MX Player and ES Media Player on our Android devices, but used the QFile app’s own player on the iOS devices. For our tests, we loaded the QGenie with standard definition MP4 files and streamed them from the QGenie’s internal storage to our five connected devices. The five streams played to our smartphones without any problems, but the fifth stream started only after a delay of about 30 seconds. 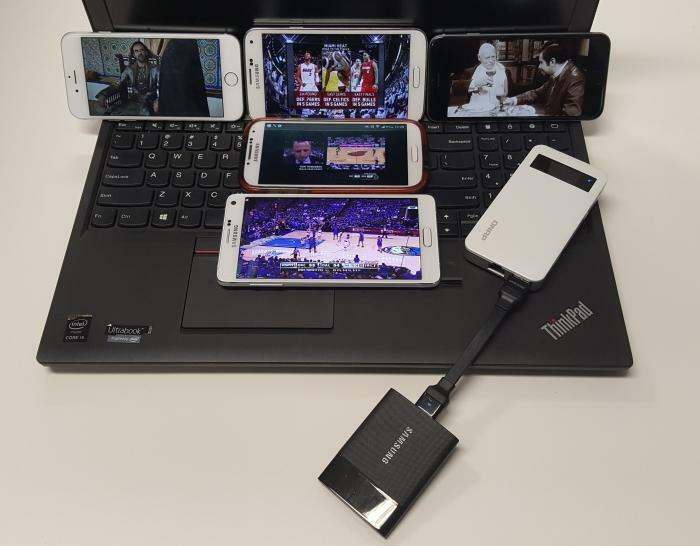 Streaming to five devices from the QGenie and an attached Samsung SSD. We also played a combination of two streams off the internal storage, and three streams off a Samsung Portable SSD that we plugged in to the USB port. In this scenario, we noticed stuttering off the three USB streams after a while, and then they eventually stopped altogether, forcing us to hit play again on each one. In addition to accessing playing media files, the portable NAS can be used as a place to upload photos and other data from your phone (as well as back up phonebooks). This can make it a handy local backup device while you are on the road. At home, you can plug the QGenie into your wireless router and access its files from computers. Backing up photos from a phone.